Los Angeles, CA (March 10, 2015) — Alchemy is proud to announce the home entertainment release of Daniel Alfredson's (The Girl Who Played with Fire, The Girl Who Kicked the Hornets' Nest) true crime thriller, Kidnapping Mr. Heineken . Starring Academy Award® winner Anthony Hopkins (The Silence of the Lambs, The Elephant Man, Thor), the action-packed caper film will be available on DVD and Blu-Ray beginning April 14, 2015. In 1983, a group of childhood friends pulled off the crime of the century: kidnapping one of the richest men in the world, the heir of the Heineken beer empire (Hopkins). The shocking capture--by gunpoint on the streets of Amsterdam--resulted in the largest ransom ever paid for a kidnapped individual. It was truly the perfect crime…until they got away with it. 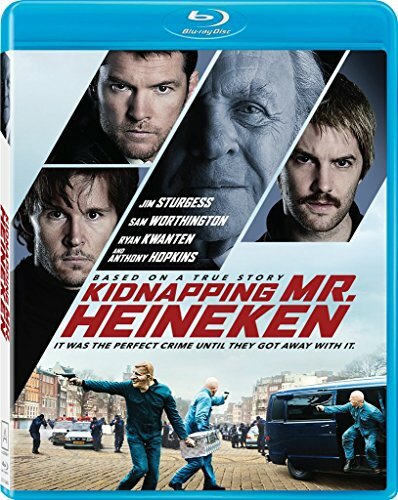 Based on a true story, Kidnapping Mr. Heineken also stars Sam Worthington (Avatar, Terminator Salvation, Clash of the Titans, Wrath of the Titans), Jim Sturgess (21, Cloud Atlas, Across the Universe, Stonehearst Asylum) and Ryan Kwanten (HBO's "True Blood," Knights of Badassdom, Don't Fade Away). Alchemy is a leading independent distributor of film and television content across all platforms and windows in North America. Alchemy develops tailored distribution strategies across all platforms, from theatrical release to home video, VOD, and television. The company has distributed the work of some of the world's finest filmmakers including Richard Linklater, Werner Herzog, Gregg Araki, Dito Montiel, John Hillcoat, John Turturro, Lee Daniels, Oren Moverman and James Cameron. Recent successes include ELSA & FRED, FADING GIGOLO, WHAT MAISIE KNEW, RAMPART, and BERNIE. Up next the company will release director Daniel Alfredson's KIDNAPPING MR. HEINEKEN starring Anthony Hopkins, Jim Sturgess, Sam Worthington and Ryan Kwanten. Alchemy boasts the independent industry's pre-eminent end-to-end supply chain solution for physical and digital distribution of content to major retailers. The company has the largest footprint of any independent supplier to bricks and mortar businesses, and is one of only two independent aggregators for Target, where Alchemy titles represent 75% of all independent product sold. It is also the leading supplier to digital platforms including iTunes, Netflix and VOD. The company owns a catalog of 665 film titles and has deals for the ongoing distribution of film titles and programming for clients including PBS Distribution, Magnolia, FUNimation, Inception, Gravitas Ventures, Hammer Horror, WellGo, MPI, NCircle, Music Box Films, and eOne, among many others.